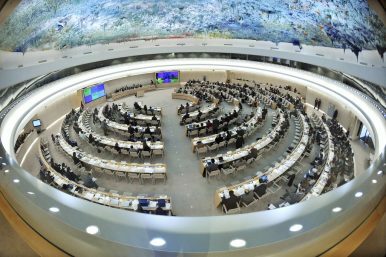 Australia now looks certain to take a seat at the UN’s Human Rights Council, but will it be constructive or a spoiler? Australia’s chances of being elected to the UN Human Rights Council were always good, but they just got a lot better. With France now officially pulling out of the race, both Spain and Australia should now be able to waltz in and take the two remaining seats available for members of the “Western European and Others Group” of UN Nations. They do still need to be endorsed by a majority of nations in the General Assembly, but this is undoubtedly the Australian government’s very own “Steven Bradbury moment” at the UN, as it would be almost unheard of for unopposed candidates to be rejected. However, getting a seat at the table is one thing – how it will be used and whether Australia’s voice will be taken seriously is another. A pledge to be a “pragmatic, principled, and passionate” promoter of human rights around the world has been at the heart of the Australian pitch to be elected to the world’s peak human rights body for the 2018 to 2020 term, but what evidence is there to support this claim? A nation passionate about human rights would surely enshrine their protection in law, yet Australia is the only Western democracy without a national human rights act or bill of rights. A nation that took a principled approach to human rights surely wouldn’t knowingly breach international law again and again. Yet Australia has stubbornly rejected every single call from the UN to abandon its cruel treatment of people seeking asylum – its policies blatantly and deliberately breach international human rights law in a gruesome attempt to deter people from seeking safety in Australia. This leaves pragmatism. Hopefully Australia is not signalling a pragmatism that puts trade and naked self-interest ahead of protecting the victims of human rights abuses. What is desperately needed at the Council, by victims in Syria, North Korea, and elsewhere, is principled and consistent leadership on human rights. Unfortunately, Australia’s track record suggests that “pragmatism” could be a diplomatic dog whistle to less scrupulous nations that Australia can be relied on to turn a blind eye to abuses and not to rock the boat too much. That pragmatism has also seen Australia remain relatively silent in the face of the deterioration of democracy and the rule of law in Nauru, and attempt, at times, to weaken the Council’s scrutiny of human rights abuses in Myanmar and Cambodia. Talking about Australia’s candidacy last year, Foreign Minister Julie Bishop bizarrely boasted that Australia was the first Western country to advocate for the end of human rights monitoring in Myanmar. To not only mention this unscrupulous act, but to use it as a selling point was breathtakingly cynical. Australia has been willing to cross its traditional allies – the United States and United Kingdom – to oppose the Council’s investigations into war crimes in Sri Lanka. Australia was “pragmatically” prioritizing its need for Sri Lankan government cooperation to intercept and forcibly return the persecuted into the hands of their persecutors. Australia’s candidacy has also relied heavily on our position in the Pacific region. The Pacific region has never been represented on the Council, but it’s also a region which highlights Australia’s failings as a potential human rights leader. Following an address to the March session of the Council in Geneva, Australia’s Senator Concetta Fierravanti-Wells took to Twitter to proclaim that Australia will be a voice for human rights in the Pacific. Awkwardly for her, the Council then heard from a group of Melanesian nations raising awareness of the serious and ongoing human rights abuses occurring in Indonesia’s Papuan Provinces – abuses that successive Australian governments have preferred to sweep under the carpet. While Australia should be a positive force for human rights in its region, its refugee policies have been a catalyst for human rights regression. For example, Australia’s offshore detention regime has seen the Papua New Guinea government attempt to water down human rights protections in its own Constitution. Clearly just how passionate and principled Australia would be as a Council member is up for debate, but there are some signs that at the very least it is moving to get its house a little more in order at the UN. In the wake of the child abuse scandal in the Northern Territory’s Don Dale youth prison, and following advocacy at the UN by the Human Rights Law Centre, Australia has finally signaled its intention to ratify by the end of the year the UN’s anti-torture protocol, which requires independent oversight of all places of detention. However, no amount of good housekeeping is going to distract people from the elephant in the room – Australia’s treatment of people that come to its shores seeking protection and safety. The UN couldn’t make it any clearer. Every expert report, every committee finding, every investigation, every time, has made it abundantly clear that Australia’s refugee policies breach international law in numerous ways. There is simply no escaping this reality. If the Australian government truly wants to be a human rights leader at the UN, then it must stop being a human rights laggard at home. Will APEC leaders stand by while Australia condemns hundreds to indefinite offshore detention – including in PNG?